For the unfamiliar, the above proof that one terrible game will not spell the end of Linsanity is a goof on Mars Blackmon, a character played by Spike Lee who initially appeared in Lee’s 1986 film She’s Gotta Have It. Blackmon subsequently starred in a whole mess of Air Jordan commercials for Nike – and tonight, Lee brought him back. Well, kind of. And we’re glad. Who knows, maybe it’ll even pave the way for Lin to sport the Mars Blackmon look for real sometime. And it definitely made people think a lot about Mars Blackmon. Well played, Spike. 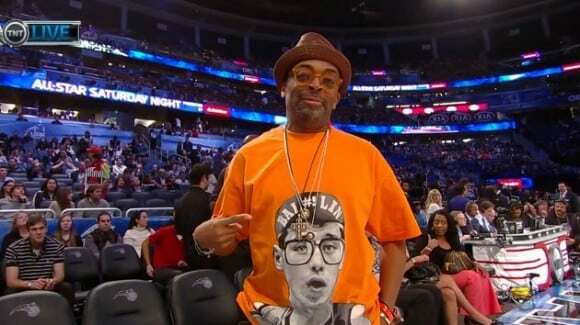 Oh, and Spike wasn’t only promoting his stuff by wearing that shirt. The shirt itself was made by the folks at The Forest Lab. Something tells us this page will be getting a lot more visits after tonight.